Once I was left with too much pulav as some guest did not turned up. I ate it twice, cannot eat it more, but did not wanted to throw it even. 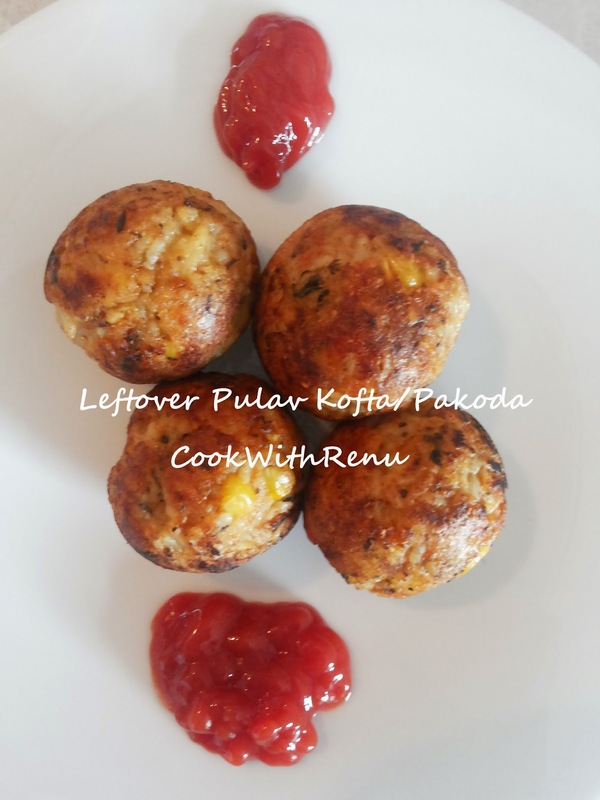 Did not wanted to make a fried version of the rice pakoda’s so thought of making the kofta’s or pakoda’s in appe pan. Rice also finished and had a healthy version instead of frying it. I served this as a starter and my family was not able to guess that it is made of left over pulav. Combine the pulav and press it in hour hand, so that the rice and the vegetables gets slightly crushed. Try to form balls. Sprinkle little water if the balls are not getting formed. Heat the appe pan. Grease it with oil. Once hot, add the balls and let it cook on medium gas. Keep turning in between. It will be done once it is golden brown on all the sides. Yummy kofta’s are ready. Serve it with tomato ketchup as a starter. That a lovely way to use up leftovers. I have some pulao left from dinner now….will try this for snacks tomorrow!